A rendering of SunTrust Park , the new home of the Atlanta Braves. This was no ordinary brick laying. 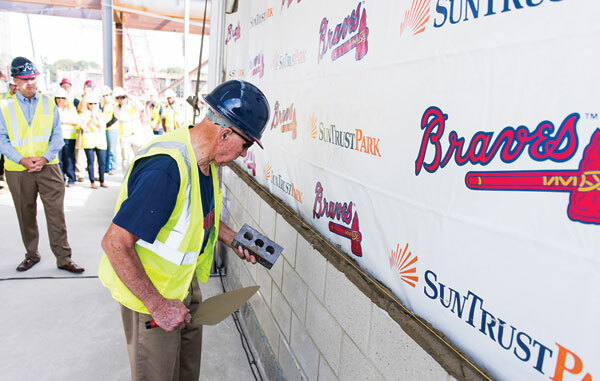 Forty-one years after Atlanta Braves slugger Hank Aaron hit his historic 715th home run — the one that surpassed Babe Ruth’s all-time record — he carefully slid a trowel with mortar across a red brick and placed it alongside another emblazoned with words commemorating the start of construction of the Braves’ new stadium, SunTrust Park. Aaron was joined at the August 27, 2015, ceremony by Eutis Morris, who had laid the first concrete block at Atlanta Fulton County Stadium — where Aaron blasted that record-breaking home run — as well as the first and last bricks at what would become known as Turner Field, where the Braves won the 1995 World Series. Current Braves slugger Freddie Freeman, donning a hardhat designed like a Braves batting helmet, also joined in cementing a brick. 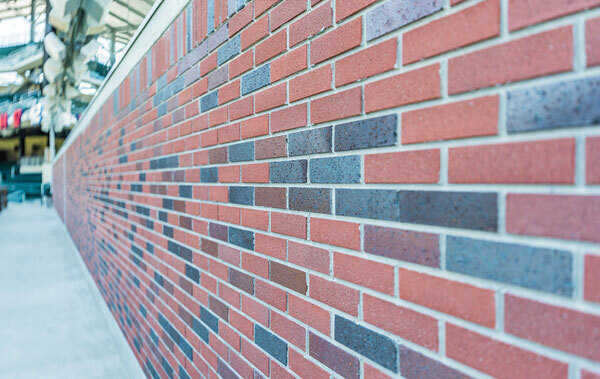 Brick walls flank the first base entrance of SunTrust Park, shown in this photo after completion of construction. With those first ceremonial bricks, the foundation was laid for what would become the fastest-built Major League Baseball stadium in American history. What would come next, in its own record-breaking pace, would be a stadium true to Southern tradition and built with eye-popping amounts of masonry, cutting-edge technology and creativity. In the fall of 2013, the Atlanta Braves officially announced they were leaving Turner Field, their home of 20 years, and heading just north of the city to Cobb County. Once the move was finalized, architectural firm Populous and American Builders 2017, a joint venture between New South Construction, Brasfield & Gorrie, Mortenson Construction and Barton Malow Company, knew they were swinging for the fences with the aggressive timeline. With a short 29-month turnaround expected, the team immediately began developing the park’s hybrid design of concrete, steel and precast stadia. 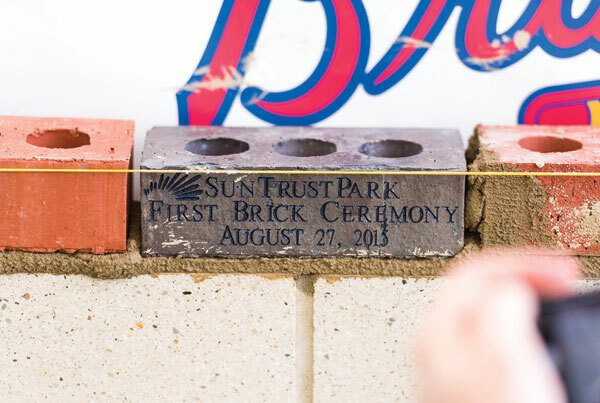 A brick commemorating the start of construction of SunTrust Park. Eutis Morris lays a ceremonial brick. 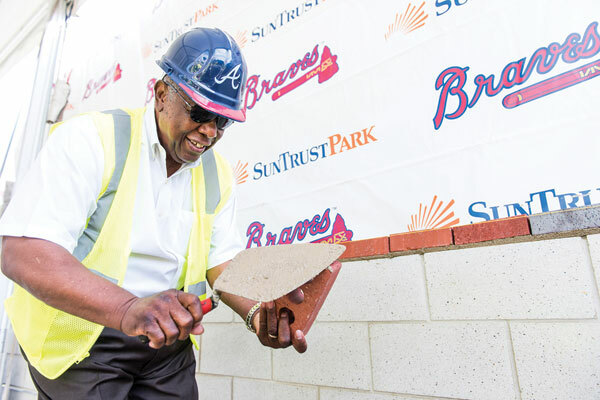 Hank Aaron also participated in the bricklaying ceremony. One of the brick walls of SunTrust Park. Doug Davidson, New South Construction’s CEO, was excited to join Populous and American Builders to continue New South’s longstanding relationship with Atlanta’s Major League Baseball club. Previously, New South had completed about 300 projects at the Braves’ former home, Turner Field, including the 7,000-square-foot elite SunTrust Suites, the complete renovation of the 755 Club/Delta 360 Lounge, and the Chick-Fil-A mascot — a 40-foot tall, 7.5-ton, tomahawk-chopping cow perched on the roof in left field. The Braves envisioned a stadium that captured baseball’s heritage while also embracing the South’s traditional architecture. Populous embraced this vision and designed the ballpark to include a variety of outdoor spaces where fans can lounge and experience a relaxed social environment while taking in a ballgame. 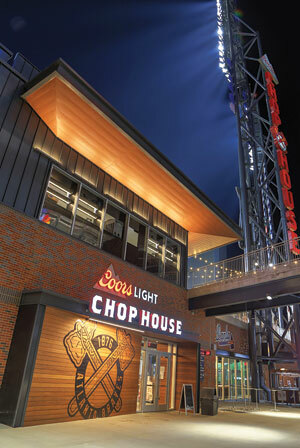 These include the three-level Chop House, a restaurant that includes two large patios overlooking right field, and the Xfinity Rooftop venue, which features one-of-a-kind views of SunTrust Park. To stay true to Atlanta’s roots, Populous sourced the region for local natural stone and brick to stay consistent with Atlanta’s signature brick cityscape. By incorporating modern, innovative techniques, the team created a millennial-friendly ballpark with a traditional façade and feel. Before construction began, one of the many challenges facing the design and construction team was the fast-tracked schedule. Because of the time constraints, the team decided to go with an architectural precast with a thin brick overlay as opposed to traditional hand-laid brick. “Though there are some areas of hand-laid pavers and stone, the majority of the exterior masonry walls are brick, and the brick is cast into the architectural precast panels,” said Rob Ragan, New South’s vice president of business development. By using the precast, construction crews and brick masons could work on the exterior façade of the stadium off-site while construction on-site simultaneously moved forward. As an added benefit, the precast walls were easier to install and were a safer alternative to masons hand-laying bricks while perched atop tall scaffolding. Precast on the exterior walls of the stadium also allowed for greater quality control during the brick-laying process. As a base element for the exterior brick, Populous sourced more than 600 tons of Crab Orchard stone from Silvara Stone in Crossville, Tenn. The one-of-a-kind stone, which creates a warm and inviting atmosphere, was also constructed into several benches in front of the stadium, as well as the columns lining its border. In order to meet the needs, the quarry extracted more than 3,000 tons of Crab Orchard from across the Cumberland Plateau. The exterior of the stadium is primarily a three-color-blend, wire-cut brick, which gives the walls a traditional Southern texture. Burgundy Sands No Black, Medium Ironspot #46 and Dark Ironspot Endicott brick are used throughout the stadium, along with decorative glazed brick for accents. Hand-laid pavers line the walkways around the stadium as “forever monuments,” part of SunTrust Park’s Legacy Brick Program that allows families and businesses to leave their mark on their home field by purchasing personalized brick pavers to be installed on the northern side of the ballpark’s exterior, behind home plate between the first-base and third-base gates. Outside the stadium, natural stone is infused in sidewalls and landscape bedding is capped with capstone material. The hardscaping around the ballpark is dense with native and regional vegetation and stone. Crab Orchard was also used in large blocks around the perimeter, which doubles as a retaining wall and safety element. The blocks are large enough to prevent vehicles from gaining access to the pedestrian areas and high-traffic walkways. According to Albers, “We decided to use these large, cut, textured stones as opposed to standard metal pylons because it helps bring everything together.” In fact, every type of stone and brick on the outside of the stadium is also present inside the stadium. The ballpark boasts some impressive numbers: more than 57,300 cubic yards of concrete, 5,600 tons of rebar, 6,800 tons of structural steel, 231,890 linear feet of piping, 502,000 concrete masonry unit blocks, and 602,000 hand-set bricks were used to construct the three-tiered, 41,500-seat stadium. SunTrust Park is the first new-construction ballpark to install LED lighting. Not only are LED lights cost- and energy-efficient, but from an operational standpoint, they allow the home team to turn the lights on and off without delay. The colors of the lights can also be changed, which allows for special theatrics after a home run, a game win or any other special moments during the game. Additionally, the LED lights are better for television broadcasts and make it easier to meet the very specific MLB requirements for light levels on the playing field. In fact, Freeman, the Braves’ all-star first baseman, already has commented positively on the lighting at SunTrust Park. The Braves also wanted top-of-the-line technology to satisfy millennial crowds. 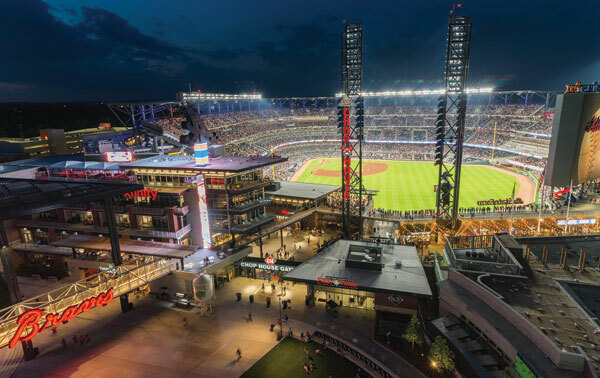 This was achieved by running more than 250 miles of fiber-optic cable throughout the stadium and the adjacent retail center, allowing SunTrust Park to offer 800 Wi-Fi hot spots to fans. In March 2017, the Braves extended another warm welcome to “Hammerin’ Hank” when Aaron returned to SunTrust Park for the unveiling of Monument Garden, one of the main areas where memorabilia is showcased in the stadium. Monument Garden is nestled behind home plate on the main concourse and allows fans to get up close and personal with the displays, much like the National Baseball Hall of Fame and Museum in Cooperstown, N.Y. The showcase features masonry, audio, light and water elements, and the main focal point is a custom-commissioned statue of Aaron surrounded by water features built with Crab Orchard stone and cast stone–capped walls. The walls in Monument Garden are filled with hand-laid brick, which tie in with the exterior masonry components of the ballpark. In total, crews logged more than 5.6 million man-hours to complete the ballpark, which, as a bonus, is LEED certified and the recipient of regional and recycled points for using locally sourced stone and CMU block. SunTrust Park is a world-class venue that offers the ultimate fan experience with a classic ballpark feel, modern amenities and Southern hospitality to create a fan experience unlike any other. Ragan credits the success of the project to the teamwork from the joint-venture partners, design teams, the Atlanta Braves organization and county officials. 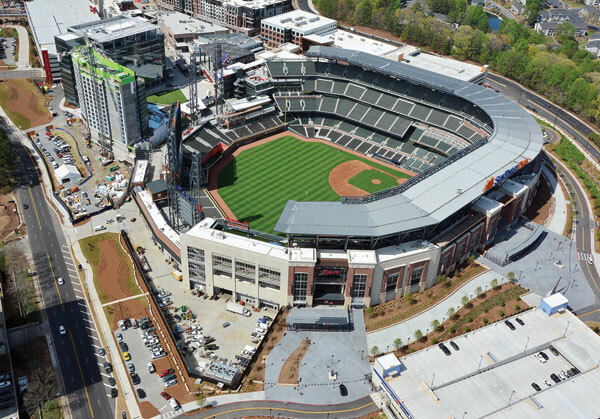 BBA Partners of GA, LLC / Whiterock & Associates, Inc. (a joint venture), Orlando, Fla.
Brightview Landscapes, LLC, Atlanta, Ga.
Adam Cobb, of New South Construction, was the project manager on SunTrust Park. 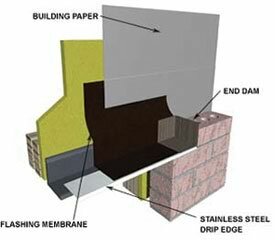 Moisture entering buildings has the potential to cause problems for the health and well being of the building inhabitants if the building envelope is not designed and constructed properly. Thus, the flashing of masonry for exterior openings is tremendously important to architects, engineers, and contractors.